If you are to dine well, the space where you make and break bread matters. So we beg of you, don’t fall victim to the following overdone, outdated and woefully impractical trends. Some are clear vintage atrocities, while others are current trends we feel have overstayed their welcome. Cluttered wallpaper is just the worst. The patterns are oftentimes difficult to distinguish and may make your guests feel like the walls of your kitchen are closing in on them. One word: WHY? Computers are a huge distraction and have no business being in a relaxing kitchen. Besides, it will become just one more surface to pile your junk mail on. All of your other appliances have a built-in home, so why should the microwave be excluded? A countertop microwave wastes cooking space and detracts the eye from noticing anything else in the kitchen. It’s time to find a new home for that bulky appliance. 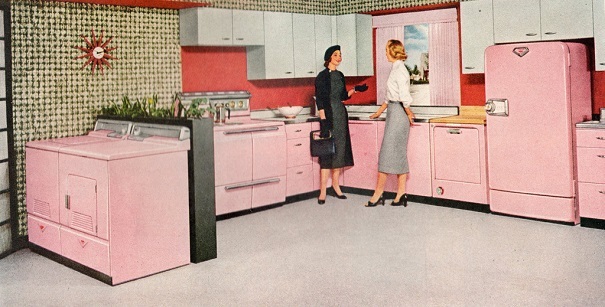 Please let us never return to an era of pepto-bismol pink and Easter egg blue! Just in case you doesn’t see the problem here, imagine everything you’ve ever dropped on the floor while in the kitchen: coffee, pasta sauce, powdered sugar…etc. Throw all that on carpet and it’s not all coming out. Promise. If you are trying to master the log cabin look, this is not how it is done. Wood panels come across as unfinished and old. Besides, no appliances pair well with this style. This may come as a surprise to some, but cherry wood cabinets are hard on the eyes. Is it red or is it brown? Plus, your kitchen will look more like a living room, office or bedroom. Kudos if you can keep these compartments tidy! However, most we’ve come by are stuffed far too tight with miscellaneous cooking and baking commodities. Place foodstuffs in small cabinets or pantries that’ll be easier to organize. We love the idea behind appliance garages for hiding items like toasters, but they waste much needed counter space. All cabinets should be raised above the counter. The kitchen is a sacred space. In order to fully appreciate cooking and dining with loved ones, never put a TV in the kitchen. Especially on the counter. TVs belong in rooms with couches.